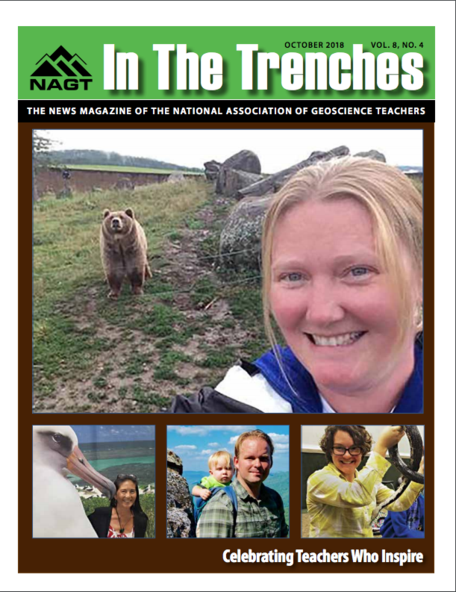 Each year NAGT sections honor outstanding precollege teachers and other who have made exceptional contributions to the stimulation of interest in the Earth sciences. This year's honorees include (clockwise from top): Natalie David-McGrath, Livingston, MT, shown (on the safe side of an electric fence) with a rescued bear at the Montana Grizzly Encounter; Brenda Paul, Johns Creek, GA; Russel Kohrs, Mount Jackson, VA, with son Gratian; and Diane Tom-Ogata, Honolulu, HI. ELIZABETH NAGY-SHADMAN, Pasadena City College, Pasadena, CA; TIFFANY RIVERA, Westminster College, Salt Lake City, UT; CHRIS BERG, Orange Coast College, Costa Mesa, CA; MARK ABOLINS, Middle Tennessee State University, Murfreesboro, TN; WILLIAM HANSEN, Worcester State University, Worcester, MA; DAREN NELSON, University of North Carolina at Pembroke, Pembroke, NC; LAURA RADEMACHER, University of the Pacific, Stockton, CA, MATHIEU RICHAUD, California State University, Fresno, Fresno, CA. Detailed stories (Bruckner et al., 2017) created by participants are available online and contain preparation tips, activity duration, modifications, and student reactions to activities. RUSS COLSON, Minnesota State University– Moorhead, MARY COLSON, Horizon Middle School, Moorhead, MN. Russ and Mary Colson are coauthors of the NSTA Press book, Learning to Read the Earth and Sky. 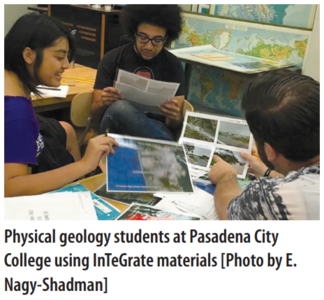 Outstanding Earth Science Teacher Awards (OEST) are given for "exceptional contributions to the stimulation of interest in the Earth sciences at the pre-college level." Any teacher or K-12 educator who covers a significant amount of Earth science content with his or her students is eligible. Ten national finalists are selected, one from each NAGT regional section. Some sections also recognize state winners. The OEST Awards program is designed to identify excellence in teaching, recognize and reward excellence in teaching, stimulate higher levels of teaching performance, establish NAGT as a strong support organization for pre-college education, and, via active statewide and sectional programs, build a solid state, regional, and national liaison with administrators of pre-college Earth science education. The Miner Award, given for outstanding contributions to the stimulation of interest in the Earth sciences, was awarded to Rachel Beane of Bowdoin College, Maine. The Shea Award, given to honor individuals for exceptional writing or editing of Earth science materials of interest to the general public and/or teachers of Earth science, was awarded to Callan Bentley of Northern Virginia Community College. The Christman Award, given in recognition of those who have provided distinguished service to NAGT at the national and/or section level, was awarded to David Mogk of Montana State University. The JGE Award for Outstanding Paper was awarded to David A. McConnell, Leeanna Chapman, C. Douglas Czajka, Jason P. Jones, Katherine D. Ryker, & Jennifer Wiggen for their paper "Instructional Utility and Learning Efficacy of Common Active Learning Strategies," JGE: November 2017, Vol. 65, No. 4, pp. 604-625. The Biggs Award, GSA's award for excellence in Earth science teaching by undergraduate faculty who have been teaching full-time for 10 years of fewer, was awarded to Nicole LaDue of Northern Illinois University. The Totten Geoscience Education Research Award, given in recognition of outstanding research emerging from the geoscience education, geocognition, or related fields, was awarded to Caitlin K. Kirby (faculty awardee) of Michigan State University. The Geo-CUR Award, given in recognition of outstanding undergraduate research mentoring, was awarded to Colin Laroque of the University of Saskatchewan. It's that time of year again—fall marks the beginning of NAGT's membership renewal period! We encourage you to renew now so that you receive uninterrupted membership benefits in 2019. NAGT is deeply thankful for everyone whose commitment to geoscience education leads them to become a member and support the work of the Association. 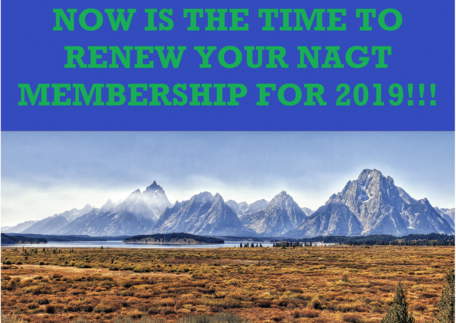 Now is the time to start thinking about renewing your membership for 2019, which you can do easily at http://nagt.org/nagt/membership/index.html. Remember that you can sign-up for automatic renewals or multi-year memberships if you want to easily continue receiving membership benefits without worrying about letting them lapse. Please also consider an added donation this year—NAGT programs and activities are more innovative, far-reaching, and effective because of your support! What makes NAGT? The answer is simple: our valued members. Whether you're interested in promoting Earth literacy, keen on joining a community of peers, passionate about teaching the sciences, or eager to learn about new teaching tools and resources, NAGT has so much to offer. Need a reminder of the great benefits of being an NAGT member? Check out the newly redesigned Member Benefits webpage. Thank you for being a part of the NAGT community. 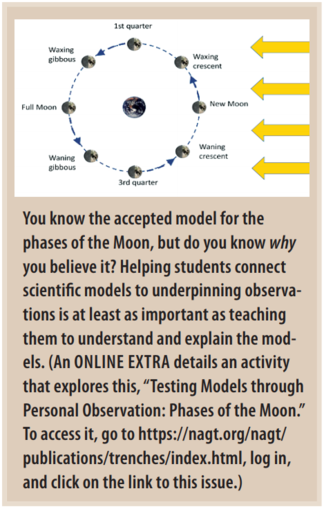 Investigative Classroom Science: A Cure for National Skepticism of Science?